1credit: Break ice subroutine on a piece of ice with 3 or more subtypes. 2credit: Swap Sadyojata with a deva program from your grip. If the first piece of ice Rielle "Kit" Peddler encounters is a NEXT Bronze, giving it the code gate subtype, is it considered to have 3 subtypes for the purpose of breaking with Sadyojata? No. Changes in subtypes are tracked cumulatively, but the state of having a subtype is binary. Can the Runner use Sadyojata to swap in another copy of Sadyojata from the grip? Yes. Sadyojata does not specify "that is not a copy of itself". Is swapping Sadyojata with another deva considered an installation? No. Swapping just exchanges the places of the two cards. If Sadyojata is hosted on Scheherazade when it is swapped with another deva, must the new Deva also be hosted on Scheherazade? Does this gain the Runner 1? Yes, the swapped deva exchanges places with Sadyojata, so it must be hosted on the same card. The new deva is not installed, so the Runner does not gain 1. If Sadyojata is hosting The Personal Touch when it is swapped with another Deva, is The Personal Touch trashed or hosted onto the new deva? Trashed. The hosting card was removed from play, so all hosted items are immediately and unpreventably trashed. If the Runner has no unused MU, can they still use Sadyojata's swap ability without trashing programs to free up MU? Yes, because the rule about MU and trashing is about installing. Swapping is a simultaneous exchange of two cards. The moment the one deva is coming into play the other is leaving, with no overlap, so there is no need to free up MU. As I look at this card, I'm thinking it finds natural synergy with some of the things people are doing with Kit and Haley right now. Sadyojata makes sense in a Haley/Panchatantra-based rig that's cycling Sharpshooter and/or Deus X but doesn't have the influence to include Gingerbread (perhaps because it's burning influence on other cards like Spy Camera, Tech Trader, and Clone Chip). Using Sady against low-strength ice with 2+ subtypes (ex. Rototurret, Brainstorm, Yagura, Resistor, Cobra, Shadow) lets you save your trashable breakers for serious obstacles. This makes it possible for you to make more exploratory runs against face-down cards, and to run through a deep glacier without hemorrhaging all of your trashable cards on a single run. Again Gingerbread is better for this (except for ice with exactly 2 strength), but for a shaper who can't spare the influence for Gingerbread, Sady is your second-best friend. Sady has a friend in Kit's ID ability, which is not true of Gingerbread. She also combos well with Tinkering and Paintbrush, which likewise are tools that offer more benefit to Kit than to most other runners. The devas in general are friendly towards a lot of 2nd- and 3rd-tier shaper tricks. Exile can trigger his card draw with a Test Run of a deva from the heap, then swap it with another from the grip. Spending credits during a run to swap devas sounds like something Nasir would like to do. The Professor can include one each of Aghora and Vamadeva at no influence cost. Installing a deva onto London Library and then swapping it with another one allows you to cheat out any of the devas for 2 credits each. None of these tricks are particularly powerful, but they're all the kind of fun stuff that people associate with shaper and will fit well into a casual deck. Probably worth mentioning that if you can get 2 Panchatantras into play, you can break any ice in the game with this. Depending on how subtype heavy your opponent's ice set up is, you might get away with just one. Maybe not the most efficient choice ever, but it could work. Interesting potential with Aghora but too costly IMO. Until we see a Deva type icebreaker with a lower initial install cost I don't think either of these options are efficient enough to warrant replacing some of the current go-to icebreaker suites. The Criminal faction Deva breaker will determine whether the three are good or garbage. 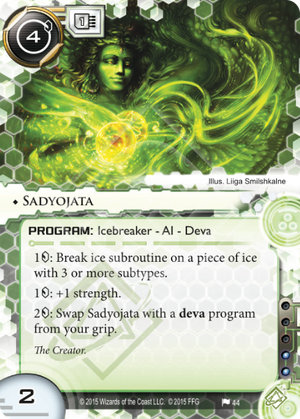 If it's a modest 2-3 cost breaker with the same 2 credit ability to swap out it'll turn Sadyojata and Aghora on. If it's a similarly costed install, I think we'll all pass on it.